Last week, only a month after the hurricanes that devastated parts of North America, Storm Ophelia whirled up from the Azores to cause devastation in western Ireland, reaching wind speeds of 119 mph in County Cork—the most severe eastern Atlantic hurricane on record, and the sixth major hurricane in the Atlantic hurricane season, exactly thirty years after the now mythical Great Storm of 1987. At the end of the same week, Storm Brian lashed across most of England, bringing high winds and huge waves along southern coasts. Ophelia over Ireland. Image: Wikipedia Commons. For those of us lucky enough to be safe from the life-threatening effects of Ophelia, our experiences were more surreal and astonishing. Monday 16th October began calm, bright and just a little cool, exactly as expected for this time of year in southern Britain. I was teaching all day and paid little attention to the outside world until the afternoon was upon us. Quite suddenly temperatures became uncomfortably warm. My students fidgeted and complained—we flung windows wide and wedged the door open to encourage a draft. Down here in Kent, in fact, temperatures reached 23.5C that afternoon, the highest UK temperature in the warmest October on record. For us, that’s a balmy spring day, and wouldn’t feel out of place or dissatisfying in summer, even. It wasn’t the heat that was most mesmerising though. It was the extraordinary colour of the sky—a lurid, apocalyptic orange that suggested some strange, cosmic conflagration. 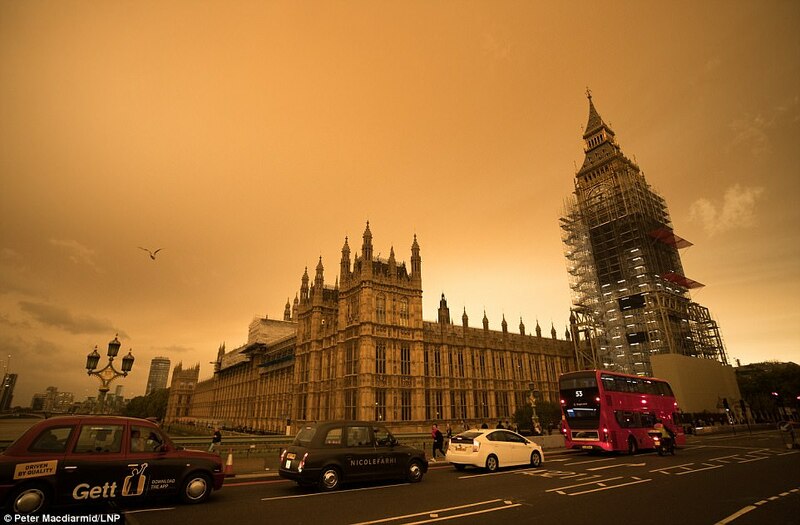 Dust from the Sahara carried on the winds and debris from huge wildfires in Spain and Portugal scattered the blue light wavelengths, and incarnadined the whole sky. The gloaming brought a disorientating haze across everything, that seemed to equally expand and foreshorten distances and turned the sun to pink copper, viewed through a supernatural element. The following day was still nebulous. It felt like we were inside it—a freakish weather happening. Orange skies over London. Image: Peter Macdiarmid, The Daily Mail. My shameless borrowing from Shakespeare in the previous paragraph is not accidental—I wanted to recall Mabeth’s famous line about ‘turning the green one [sea] red’ because I was teaching Macbeth at the time to my GCSE students. Act Two, scene four, in fact. The one where the Old Man speaks of ‘Hours dreadful and things strange’. Macbeth’s atrocities are mirrored in the great macrocosm, the cause of ‘the day’s shame’ which casts ‘Darkness’ over the ‘face of the earth’, as though ‘dark night strangles the travelling lamp’. ‘Duncan’s horses … turn’d wild in nature, broke their stalls, flung out’. Literature is full of prognostications from strange or dramatic weathers. It’s easy to see how this comes about, of course, particularly if you happen to be reading an example at the very moment these events occur! Coincidences can seem too unlikely, and truly marvellous or violent weather is so great and so unavoidably noticeable that it can make one feel there must surely be omniscient, metaphysical forces at work. The day after Ophelia made its tracks across Western Britain, a cartoonist for The Times was clearly struck by weather events’ powerful and persuasive capacities to makes us feel that there must be some correlation with current human affairs. I’m quite sure that the sketch below was humorously received by many British readers. Image: The Times, 17.10.17. Morten Morland. Unsurprisingly given the religious leanings of the pre-modern age, medieval writings include lots of meteorological predictions. The events of last week sent me back to some of these texts to seek out responses to weird or remarkable weathers up to and over 1000 years ago. In particular, I thought of The Anglo-Saxon Chronicles on that Monday (historical annals compiled by monks in various locations in the late Anglo-Saxon age). The accounts we find in these texts are not fictional, allegorical representations of weather, but genuine responses to real weather occurrences, observed and recorded as significant yearly events. I’ll leave off here, with just few entries for readers to enjoy. 793. Here terrible portents came about over the land of Northumbria, and miserably frightened the people: these were immense flashes of lightning,and fiery dragons were seen flying in the air. A great famine immediately followed these signs; and a little after that in the same year on 8 January the raiding of heathen men miserably devastated God’s church in Lindisfarne island by looting and slaughter. 806. Here the moon grew dark on 1 September. And Eardwulf, king of Northumbria, was driven from his kingdom, and Eanberht, bishop of Hexham, passed away. 1122. And after that, the Tuesday after Palm Sunday, there was a very great wind on that day, 22 March; after that many signs came far and wide in England … Afterwards, on the day of 8 September, that was on the Feast of Saint Mary, there occurred a great wind from 9 a.m. in the morning of the day until dark night. (All entries here are from the Peterborough manuscript).